Ah, the smell of lavender. 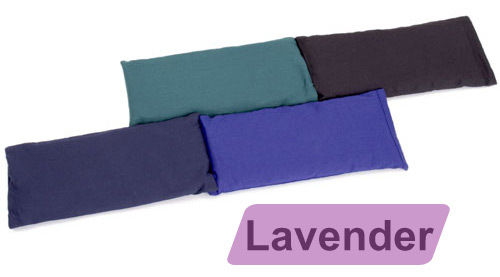 Quiet your mind and relax your body with a luxurious Small Cotton Eye Pillow, lightly scented with soothing lavender. This eye pillow is 100% pure cotton (or choose silk), and comes in several classic colors so you can coordinate with your other yoga accessories. These eye pillows have something special that many suppliers don’t offer…our pillows are filled with organic flax seeds! You'll find the soft and cooling shape will contour to your face with gentle pressure while blocking out light. The small cotton eye pillow is shown here, but it the lavender eye pillow is also available in a larger size. Perfect for deep relaxation and meditation, lavender scented eye pillows are also wonderful for relieving headaches and calming the mind. I do like it very much except it is bulkier/heavier than I would prefer it to be. It's great at last having darkness at night. Bought this pillow for final relaxation in my yoga practice and just love it. The scent is still strong and it is the perfect size/weight. I bought this pillow a while ago and I''ve washed it over ten times and the color didn''t fade at all. A lot of the cotton eye pillows on the market today are made with itchy course cotton and it makes it really hard to relax. Well that is not the case with this pillow. The cotton is extremely soft. Many of these eye pillow are made with silk and most silk isn''t vegan. That is why I was very happy when I saw that Yoga Accessories offered an eye pillow made with cotton. I was even happier when I first used it and the cotton was so soft.